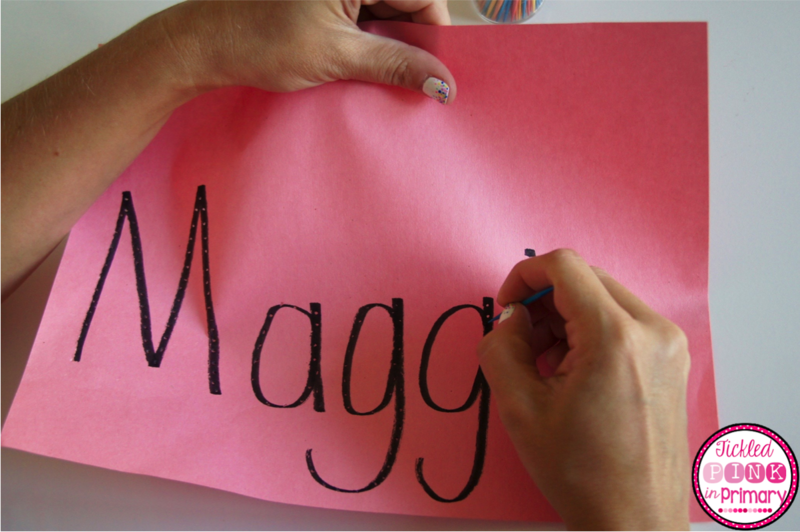 Learning how to write your name is such a big deal when you’re little. Many of us still have Kindergarten students coming to school that still don’t know how to write their name or write it correctly. It drives me nuts when students come to me writing their name in all capital letters. Who teaches them how to write that like?? I know uppercase letters are easier to form, but that’s not how to correctly write a name. I’ve even had students argue with me and tell me that’s not their name when I show them what it should look like. Here’s my proud Aunt moment 🙂 Below is a card I got from my nephew when he just turned 3. He hasn’t mastered the uppercase C, but he has the rest in lowercase and in a straight line. 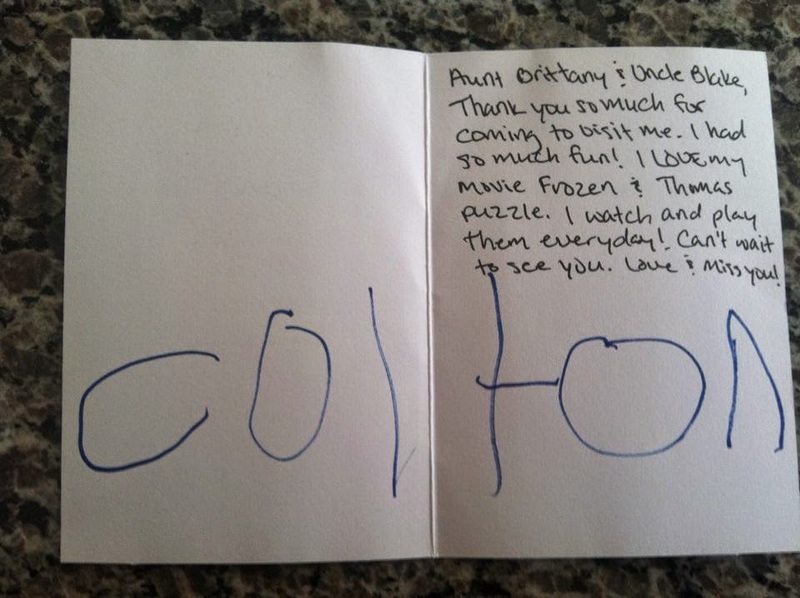 Children learn what we teach them, and I made sure my sister knew from and early age to show Colton how to write his name correctly! I work on name activities for the first few weeks of school. We talk about how to correctly form our letters and what a name should look like. I then have them rotate through some centers where they can get hands-on practice. Rainbow writing is such a easy way to practice names and they love it! 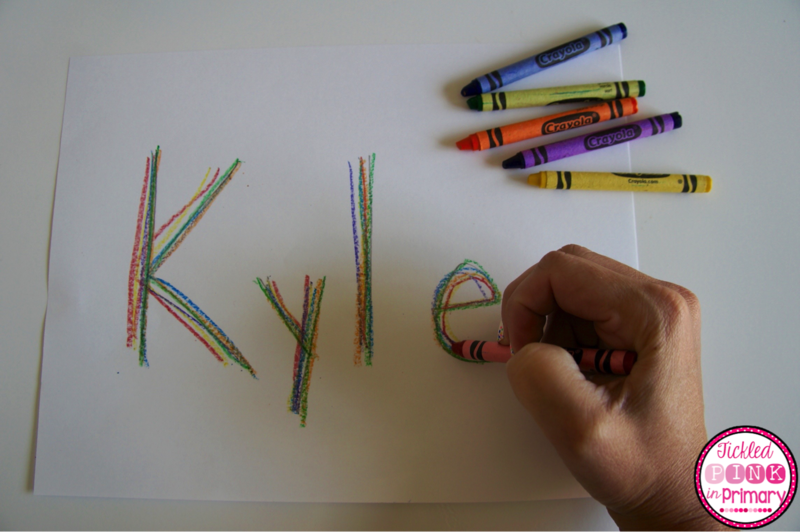 I write their name on a piece of paper and they take turns using different colors of crayons to trace their name. Super simple, yet fun! To incorporate fine motor skills and name practice, I use toothpicks. Each student gets a paper with their name on it. They then take a toothpick and poke holes through their name. This could be used for sight words, letters, numbers, etc. throughout the whole school year because the students have so much fun with it. Once they are done with their name, they can hold it up to the light and it kind of making it looks like their name is shining like stars. 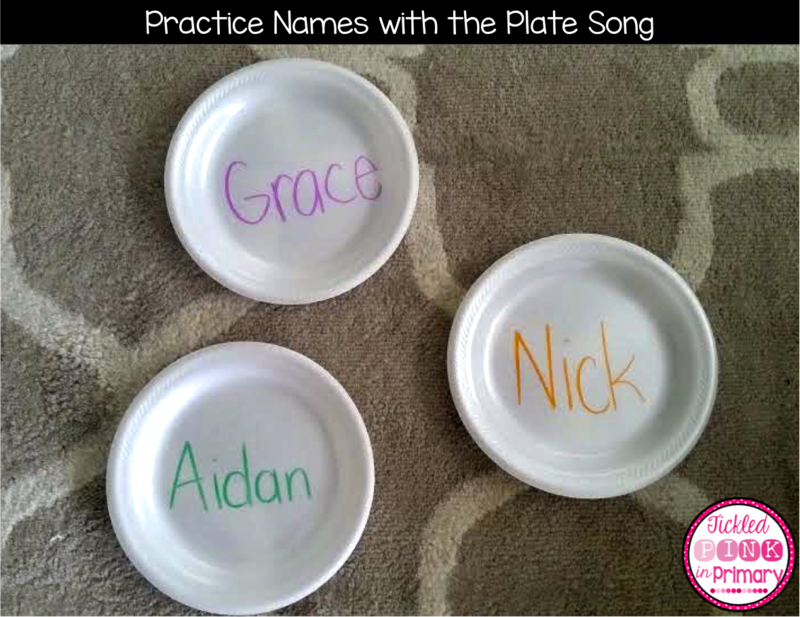 A few more name activities I use are student name puzzles and “The Plate Song”. Each student gets a bag with their name on it and a puzzle inside. The name is on the front in case they still need help spelling their name. It’s really interesting to see which students know how to put puzzles together and how they go about it. When we sing “The Plate Song,” all the students form a circle on the rug. We then sing “The Plate Song” and I throw 2-3 plates on the ground. If a student recognizes his/her name, they get to pick up the plate. So simple, but they love it! The song is very catchy too, so after 2 times of singing by myself, most of the kids have already learned it. if your name is on a plate pick it up! 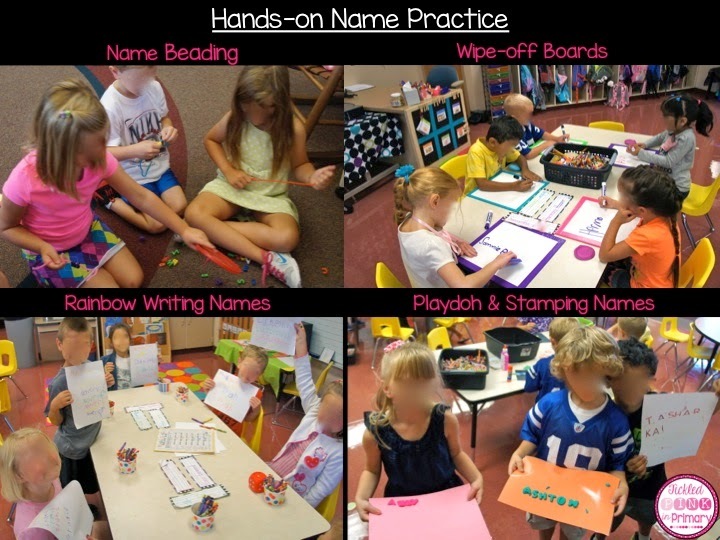 Lastly, I incorporate sorting into our name unit. This way I can work on names during reading, writing, and math! I just created this new FREEBIE for you to use your first few weeks of school. 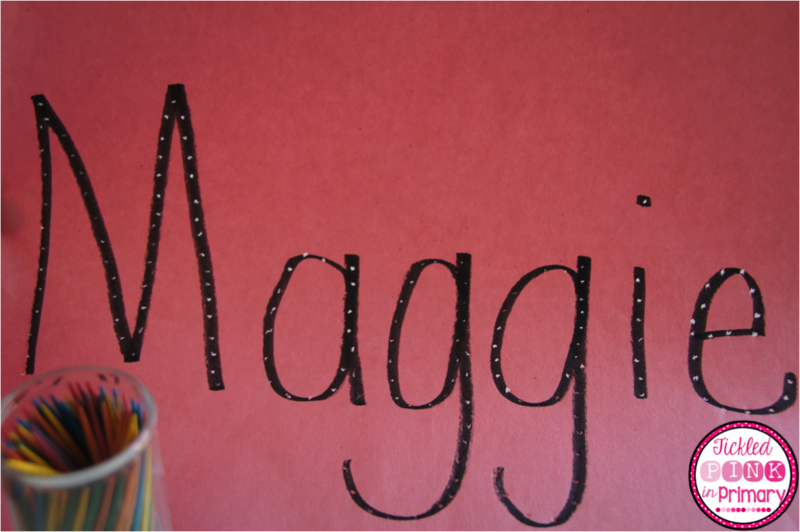 It has many activities included to help students recognize their name, as well as their peer’s names. Students can work on counting letters, clapping syllables, and sorting! I write student names on flashcards and use pictures of each student for different sorting activities. At the beginning of the year, you may just have students play memory with their friend’s pictures, but later in the school year, they could match the picture to a name. These activities could easily be put in a center tub or pocket chart. I've heard of Handwriting without Tears, but I've never seen it in action. Your comments are cracking me up! I know it's a lot easier in preschool to write in uppercase letters, it's just hard to get them to switch how they write their name in K b/c they "think" they already know how to write it 🙂 Thanks for visiting my page!